Although a “G-String Cutting” will mark the opening ceremony at The Vivid Cabaret-which will have happened by the time you read this a day ago (though the opening festivities are running well into this weekend with four days of parties)-as you can always be assured I got the skinny early on, visiting the club early this week. 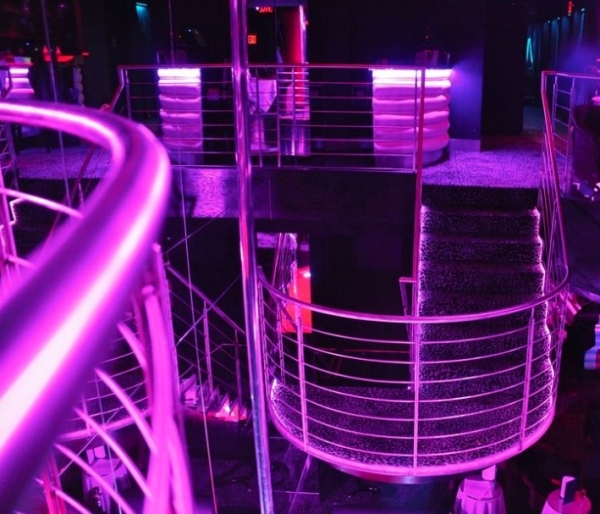 The new Vivid club is a three-story cabaret, the fourth licensed club from the leading adult studio (Vivid has clubs in L.A., Miami and Charlotte). This Big Apple space can support “at least” three dancers simultaneously on its amazing 25-foot high floor-to-ceiling stripper pole; boasts a dozen VIP champagne rooms, a state-of-the-art sound system, outdoor smoking lounge; a ‘bistro’ food menu; and a special broadcast booth for the VividRadio/Sirius XM channel, where I will be stopping by and saying hi at 11Pm tonight. My impression when I visited in the early evening hours was that the space is indeed…spectacular. That pole basically stretches from the ground floor all the way up three flights, a truly unique feature, and the main room where I spent most of my visit sports comfortable round tables with chairs, a big bar, a concave screen showing sports and probably the friendliest staff, from the doormen, to the serving girls-dressed to show just the right amount of cleavage and booty-to just about any and everybody I met. And yes, I also took notice of the lovely lady dancing round the pole not a mere few feet from me. Now in its 30th year, Vivid has become the leading adult entertainment company of the modern era. This new Cabaret in NYC is part of the “Vivid Everywhere” strategy implemented by Vivid’s founder and co-chairman Steve Hirsch. With Vivid TV–a two-year-old cable television venture reaching over 70 million households in the U.S. alone (and millions more in Canada, Europe and Latin America) Vivid Radio on SiriusXM (did I tell you I was going to be on Vivid Radio tonight? I must have mentioned it?!) and an active licensing program that puts the Vivid name on anything from condoms to tee-shirts, Vivid is indeed seemingly everywhere. This new cabaret, just east of 6th Ave at 61 W. 37th, is just another great offering from this powerhouse of a company and brand; really you have got to see the place! Check out the club’s Facebook page and website. get yourself over to 61 W. 37th street and listen to VividRadio tonight at 11 (and as much as you at other times) at http://vivid.com/vivid-radio/. God, I so love my job!